Lisa J. Bowey is an attorney in the Firm’s Phoenix office whose practice areas include trust and estate litigation, probate, estate planning, guardianships, conservatorships and mental health law. In addition to her experience in trust, estate and mental health matters, Lisa has extensive litigation, negotiation and mediation experience. Before joining the Firm, she was the Director of Assessor Litigation for the Maricopa County Assessor’s Office and member of the leadership team. Lisa was responsible for managing division personnel, the litigation of thousands of Arizona Tax Court property valuation appeals filed against Maricopa County, and advising the Assessor and Board of Supervisors regarding litigation issues. While an attorney with Helm & Kyle, Ltd., Lisa represented several of Arizona’s counties in property tax and valuation litigation, and private clients in matters involving business law and estate planning and probate. 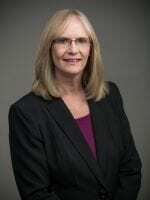 For several years she was a Judge Pro Tem for the Maricopa County Superior Court where she engaged in pro bono mediation of numerous contract and general civil litigation disputes.